Los Angeles, 1949: A secret crew of police officers led by two determined sergeants work together in an effort to take down the ruthless mob king Mickey Cohen who runs the city. $17.070 million on 3103 screens. Movie fans know that studios regard January as the month in which to dump flicks they want to “bury”. They release a slew of high-profile efforts in November/December and then view the post-holiday lull as a time to burn off the dead wood. This situation has changed a bit in recent years, especially since 2009’s Paul Blart Mall Cop became a decent hit despite its mid-January release date. That film’s success caused studios to rethink their policy and try harder to make some money in the dead of winter. Which leads us to the puzzling case of 2013’s Gangster Squad. With a cast that includes actual, honest to God stars like Sean Penn, Josh Brolin, Ryan Gosling, Emma Stone and Nick Nolte – and directed by up-and-coming Ruben Fleischer – this looked like something with real hit potential. However, it got stuck with a seemingly deadly January 11 release date. Was this an attempt by Warner Bros. to capitalize on a lack of new competition in a fallow period, or did they just want to dump the movie and be done with it? Squad seemed to receive a big promotional push; I must’ve seen the trailer in front of at least 10 different movies in the period that led to January 11. However, the result was typical for that month: Squad earned an insubstantial $45 million. That’s not a terrible take, but it’s not good, either, especially given all the star power involved. Despite its cool box office reception and mostly mediocre or worse reviews, I just couldn’t quite accept that a vehicle with this much talent behind it could be a dud, so I decided to give Squad a look. 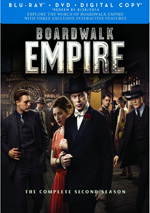 Set in 1949, we learn that mobster Mickey Cohen (Penn) leads the crime syndicates in Los Angeles, and he does so with a bloody footprint. Cohen owns many cops/judges and keeps others in line via his violent ways. Cohen wants to expand his empire but a handful of honest law enforcement officials seek to stop him. LAPD Chief Bill Parker (Nolte) chooses Sgt. John O’Mara (Brolin) to lead a special team that will use guerrilla tactics to strike at Cohen. Among these, Sgt. Jerry Wooters (Gosling) becomes the most personally involved. He meets and woos Grace Faraday (Stone), a dangerous choice because she’s Cohen’s mistress. That adds a different dynamic, as Wooters tries to work as part of the squad but also keep his new lover safe. As I mentioned earlier, I found it tough to accept that a film with as much talent involved as Squad could be a dud. Conversely, the movie’s poor reviews and unceremonious plopping into a dead release date made me semi-expect a complete disaster. After all, if a movie with so much star power can’t get a higher-profile release, it stands to reason it must be a stinker, right? That does make sense, but in the case of Squad, it’s not true: this isn’t a bad movie. On the other hand, I can’t say it’s an especially good movie, either. Squad occasionally threatens to live up to its promise, but it’s not consistent and it lacks a real punch. Fleischer brings a strong sense of style to Squad, but that becomes both a pro and a con. On one hand, he can make the film suave and daring, with visual pop that allows it to leap off the screen. On the other hand, Fleischer occasionally appears too concerned with these cinematic techniques and he allows them to become an end unto themselves. Wild stylization worked for the horror/comedy setting of 2009’s Zombieland but it fares less well for a flick like this. This leaves Squad in Tonal Limbo. At times it wants to be a gritty crime drama, while at others, it leans toward campy thrills. The two tones don’t mesh especially well, and they leave us with inconsistency. Still, I’ll give Fleischer credit for boldness, and he manages to create a reasonably entertaining movie, albeit one with diminishing returns. With its obvious Untouchables bent, Squad works best in its first act. The intriguing concept and bloody wildness capture our attention but they can’t last, and the essential lack of depth becomes more of a burden. At times, Squad hints at greater meaning, mainly due to the potential controversies it involves. When cops go outside the law, one can debate whether or not the ends justify the means, and that does become a topic here – but only a minor one. We also get segments that hint at the choice between family and public duty – mainly via O’Mara’s relationship with heavily pregnant wife Connie (Mireille Enos) – but again, this area remains insufficiently explored. As for that star-studded cast, they’re usually fine, though none of them bring anything special to their parts. Actually, I like Giovanni Ribisi as the family-oriented wiretapping Officer Keeler. I often find Ribisi to be contrived and mannered in his roles, but he brings actual heart to Keeler; he becomes arguably the only character about whom we care. Squad prefers to be a big, boisterous, stylish crime flick – and it does occasionally succeed in that regard. It just doesn’t live up to its goals with much consistency, and it fades as it goes. While I can find some pleasure in this movie, it ends up as fitful pleasure. 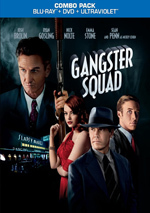 Gangster Squad appears in an aspect ratio of approximately 2.40:1 on this Blu-Ray Disc. This was a positive presentation. Sharpness looked fine. The style of photography meant a little stylized softness – and the digital cameras didn’t help - but the majority of the movie showed solid clarity and accuracy. No signs of jagged edges or moiré effects appeared, and I witnessed no edge haloes. Print flaws also failed to mar the image. Like many modern action flicks, Squad went with a teal and orange tint. Actually, given the period setting, the orange leaned a little sepia, but the stylized hues still dominated. Within their parameters, the hues looked fine; I wish the teal/orange trend would end, but I still thought the Blu-ray replicated them as desired. Blacks were deep and dense, without any muddiness. Shadows were also pretty clear. Photographic choices occasionally meant some slightly dense low-light shots – like the opening torture scene with Cohen – but these images mostly worked fine. Overall, I found this to be a satisfying transfer. Even better, the film’s DTS-HD MA 5.1 soundtrack added real punch to the proceedings. The soundfield frequently used all five channels to good advantage. The mix featured a wide and involving soundstage. Music demonstrated excellent stereo delineation, and the effects popped up all over the spectrum. Those elements showed nice localization and melded together smoothly. The surrounds played an active role and added quite a lot to the mix. Given the frequent nature of the film’s action, the soundtrack gave us many opportunities for involvement, and it never disappointed me. This was a vivid and engrossing mix. Happily, the audio quality lived up expectations as well. Speech consistently came across as warm and natural, and I noticed no signs of edginess or issues with intelligibility. Music could have become lost amidst all the effects, but the score managed to maintain its own personality. The music stayed loud and dynamic, as the track replicated the score with nice clarity and definition. Unsurprisingly, the effects packed a wallop. They were vibrant and accurate, with clear highs and booming bass. Low-end was always tight and firm; the track exhibited genuinely terrific bass response. This became a high quality track. Despite the movie’s low profile at the box office, the Blu-ray comes with a good array of extras. First we find an audio commentary with director Ruben Fleischer. He delivers a running, screen-specific look at story and characters, cast and performances, sets and locations, visual effects, period details, stunts and action, cinematography, editing and music, costumes, production design and some other areas. Overall, Fleischer offers a pretty useful track. While he delves into the usual praise at times, he doesn’t wallow in happy talk. Instead, he gives us a fairly chatty and informational overview of the film. The track never becomes great, but it’s definitely worthwhile. Called The Gangland Files, an interactive feature runs along with the movie. Introduced by actors Anthony Mackie, Giovanni Ribisi and Robert Patrick, we find no additional interview statements – not unless you count the “Focus Points” that you can select as branching features. Fleischer does pop up briefly at the end to thank us for viewing, though. Since the “Focus Points” appear on their own elsewhere on the disc, I’ll discuss them there. Other than the option to branch off to the “Points”, the “Files” gives us a mix of still elements. We see text/photos that let us see LA in the 1940s and now, and we also get pictures of the movie’s period details. In addition, we can view text that gives us facts about the film’s characters and situations. Some Blu-rays use this interactive option well, but the “Files” are fairly lackluster. While we learn some decent information along the way, the text and photos pop up with less frequency than I’d like. This means we go through fairly substantial sections with no material, and that makes this an erratic presentation. Available as branching segments during “Files” or on their own, we find 15Focus Points. 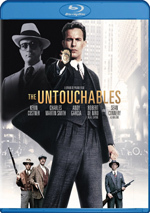 These featurettes fill a total of 46 minutes, 28 seconds and provide notes from Fleischer, Patrick, Ribisi, Mackie, executive producer Paul Lieberman, screenwriter/LAPD detective Will Beall, Jack O’Mara’s daughter Maureen O’Mara Stevens, producers Michael Tadross, Kevin McCormick and Dan Lin, Jerry Wooters’ son David Wooters, journalist Pete Noyes, original Gangster Squad member Sgt. Lindo Giacopuzzi, Officer Jack O’Mara, production designer Maher Ahmad, cinematographer Dion Beebe, costume designer Mary Zophres, SPFX foreman Terry Chapman, property master Douglas Fox, and actors Josh Brolin, Ryan Gosling, Mireille Enos, Emma Stone, and Nick Nolte. We learn the real-life story/characters behind the film and their depiction in Squad, set and costume design, cast and performances, locations, and period issues. With an average length of barely three minutes, the individual “Points” tend to be superficial, but they add up to a decent whole. While I’d prefer a single comprehensive documentary, the collective “Points” give us a nice enough look at the project. Two more featurettes follow. Then and Now Locations goes for eight minutes, three seconds and involves text and photos. If you already sat through the “Gangland Files”, these will look familiar, as they all appear during that feature. They’re interesting but redundant. Tough Guys with Style lasts four minutes, 54 seconds and offers remarks from Brolin, Stone, Gosling, Fleischer, Mackie, Lin, McCormick, Nolte, and Zophres. “Guys” offers a quick look at cast, characters and design. It’s pretty superficial and doesn’t really give us much we don’t get elsewhere. Next we find a documentary called Rogues Gallery: Mickey Cohen. It goes for 46 minutes, 44 seconds and gives us details from John O’Mara, Cohen’s friend Jim Smith, crime historian James Johnston, film/TV producer Sid Luft, former reporter Norman Jacoby, journalist Pete Noyes, and former boxer Art Aragon. We also see some archival footage of Cohen himself as well. We get a basic biography of Cohen along with a picture of crime in LA circa the 1930s/1940s and Cohen’s role in those endeavors. 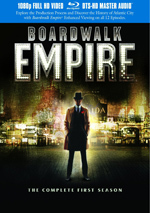 The show moves briskly and provides an entertaining look at the life of the movie’s main baddie. It’s a nice little history. After a 19-second introduction from Fleischer, seven Deleted Scenes fill a total of 12 minutes, one second. Like most cut sequences, these largely benefit the secondary characters. We find a bit more exposition and some added backstory for a few of the participants. We also see more of the main roles, too. We get additional shots of Jerry and Grace, and there’s a confrontation between Cohen and the Squad. We find a prologue to the movie’s violent opening sequence as well. It’s too bad Fleischer doesn’t offer commentary about the deleted scenes, for I’d like to know more about why he cut them. On their own, some of them are actually interesting. The Jerry/Grace pieces feel tedious, but the others bring some useful notes. The disc opens with an ad for The Great Gatsby. No trailer for Squad appears here. A second disc offers a DVD copy of Squad. It provides one extra: the “Tough Guys With Style” featurette. That’s all that appears on the retail Squad DVD, so this one replicates that product. With an excellent cast and an interesting premise, Gangster Squad boasted much potential – and it occasionally satisfies. However, it’s an inconsistent film that only sporadically involves the viewer, and it peters out as it goes. The Blu-ray brings up very good picture, audio and supplements. This is a strong release but the movie itself remains spotty.